Laura Burian is the Dean of the Graduate School of Translation, Interpretation, and Language Education, Chair of the Translation and Interpretation Program, and Professor of Chinese/ English translation and interpretation. 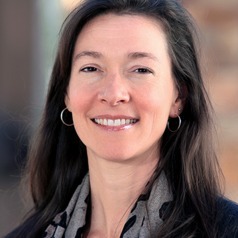 After graduating from the Institute’s Chinese Translation and Interpretation program in the 1990s, Dean Burian moved to China where she first served as Assistant Director of the Duke Study in China Program, then became an in-house Chinese/English translator/interpreter/legal assistant in the Beijing office of a New York law firm, and then became a freelancer. She maintains a dynamic portfolio of high-profile translation and interpretation clients in both the public and private sector. After joining the faculty at MIIS in 2000, Dean Burian received several prestigious teaching awards, including the Eliason Teacher of Excellence Award and the Outstanding Teacher of the Year Award. Her pedagogy aims to inspire her students to quickly become full partners in shaping the trajectory of their own professional and personal development. Dean Burian is also deeply engaged in school service, having served two terms as Faculty Senate President, and is a frequently invited guest speaker at conferences, workshops, and seminars worldwide. Her TEDx talk (co-presented with MIIS Professor Barry Olsen) is often used as a primer for students, teacher, and end-users of translation and interpretation, and earned a TED “Editor’s Pick” accolade in 2014.